The Immigration and Nationality Act (“INA”) contains criteria that make foreign nationals either inadmissible or deportable. The only difference is that deportability applies to citizens who have been formally admitted to the U.S. 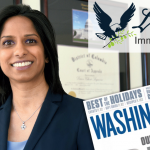 The grounds of inadmissibility apply to foreign nationals who have not been legally admitted, or who have been admitted and then either depart the U.S. or apply to adjust status in the U.S. It is important to know whether you are inadmissible or deportable because each one accrues different rights. Obviously, if you have been admitted to the U.S. you will have more rights than someone who has not been admitted. A foreign national is “admitted” to the U.S. when he or she enters the U.S. after being inspected and authorized by an immigration officer. A foreign national who has not been lawfully admitted because he or she entered the U.S. without inspection is considered to be inadmissible. So if a foreign national enters the U.S. “without inspection” and later marries a U.S. citizen, he or she cannot adjust status (obtain a green card in the U.S.) in most circumstances. Unless he or she qualifies under Section 245(i) of the INA or enters the U.S. pursuant to Advance Parole, the foreign national must file a waiver of inadmissibility and depart the U.S. to consular process. However, if the foreign national has accrued unlawful presence of more than six months but less than three years, he or she will trigger the three year bar upon departure. If the foreign national accrued more than one year of unlawful presence, he or she will trigger the ten year bar upon departure. The bar is only triggered when the foreign national departs the U.S.
Our expertise is in making prosecutorial discretion arguments to terminate removal proceedings to allow our client to present their green card cases before USCIS. Not only does this approach save our client’s time and money, but by getting the government’s permission to terminate removal proceedings, the immigration Judge signs an order that takes our client out of removal. Once the client is out of removal, jurisdiction shifts from the Immigration Court to USCIS. In some instances, the Office of Chief Counsel does not agree to terminate removal proceedings. For these clients, we have helped them obtain green cards by arguing their cases before an Immigration Judge. Call for a free phone assessment during which we will determine your legal issue and explain whether we can help you). After the free phone assessment, you can schedule an in-person consultation (consult fee applies but is waived upon signing of Retainer). Consultations can be scheduled either during officer hours (Monday – Friday, 8:30 am to 5:00 pm) or by appointment (during evenings or weekends). All messages should be in English please. 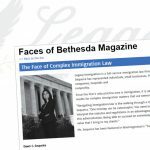 Legacy Immigration Named Among Top Lawyers In Washington , D.C.